Bluechip Stock - Should You Invest in Bluechip Stocks? Home » Stock Market » Bluechip Stock – Should You Invest in Bluechip Stocks? Bluechip Stock – Should You Invest in Bluechip Stocks? What is Bluechip Stock? Is it worth for investment? Should I invest in Bluechip Stock? A bluechip stock means stock with highest value. Bluechip stocks are stocks of well-known, well-establish, profit making companies with track record of giving superior return YOY. Take an example of MRF. MRF is bluechip stock. The stock of MRF was available at price of Rs.35000 (highest value) in 2016 and today it is trading on Rs.63000. This means MRF has generated 80% CAGR return for the investor in 1 year. Well, MRF is not an exception, there are many blue chip stocks like L&T, Infosys, Eicher motors that have generated historically very good return for the investors. This would mean that bluechip stocks are good for investment. However, on the other hand, bluechip stocks are very costly and historically bluechip stocks are worst affected stocks during the stock market crash. So, what should investor do? Let’s discuss in detail on the bluechip stock. Quality Leadership – They are led by a quality team of professionals who have decades of experience & proven track record. Tested Business Models – They have been around for several years and have established themselves as the leading players in their respective sectors. Good Track Record – They have a history of being profitable. Posting earning and paying dividends. Bluechip stocks are backed by a strong sustainable business model. Dividend Payment in Bluechip stocks is expected to be consistent. Bluechip companies are generally cash rich and debt free. Bluechip stocks are trustworthy & safe option for preserving capital. Bluechip stock can give you steady long term returns. These type of stock are less volatile. These companies are well regulated and governed. As compared to other growing company bluechip stock may end up giving a lower return. These stocks cannot be a multi-bagger (generally speaking). The cost involved in buying this stock is high as these stocks are generally trading at a higher value. These type of stocks are largely impacted during a stock market crash. These type of companies are generally conservative in exploring new opportunities. Should you invest in Bluechip stock? So, do you think blue chip stock is better compared to smaller peers such as mid cap, small caps, and penny stocks? Well, answer is yes. You should surely consider and invest in a bluechip stock for long run. This does not mean you should restrict yourself to bluechip stock only. Your portfolio should have a mix of blue chip stocks, mid cap and small cap stocks. If you are beginner you should start making your portfolio with blue chip stocks. Few bluechip stocks that you can consider for investment are Bajaj Auto, Maruti Suzuki, and Reliance Industries. 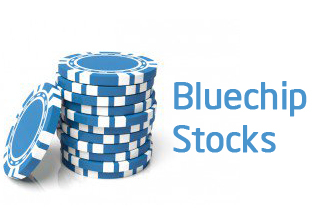 Do you invest in Bluechip Stocks?